Justin Sloan is a pretty prolific guy. As of the time I did this interview, he had 40 books on Amazon with his name on them, and was fresh out of Telltale Games, the game studio known for the Walking Dead. 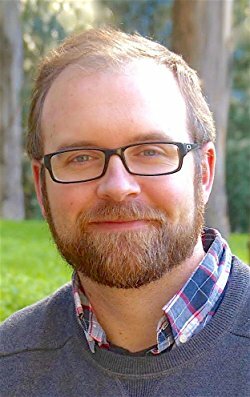 He writes science fiction and fantasy, and has worked on everything from pretty large series to screenplays. Most importantly, he’s making enough from his writing that he quit his day job – which is something every writer dreams of, but very few actually achieve. Justin writes often; 30-45 minutes a day, an hour or two on weekend days – and that adds up to a staggering 50-60k words a month. I’ve always been fascinated by writers like this – Anthony Trollope and Stephen King are two good examples a couple of centuries apart – who basically just sit down and regularly turn out an extraordinary output. So when Justin’s name showed up on a writer’s group I’d been skulking in, I immediately resumed my quest to learn the science of writing and reached out to this guy to find out how he maintains such a prolific output. Here’s my Q&A with him. 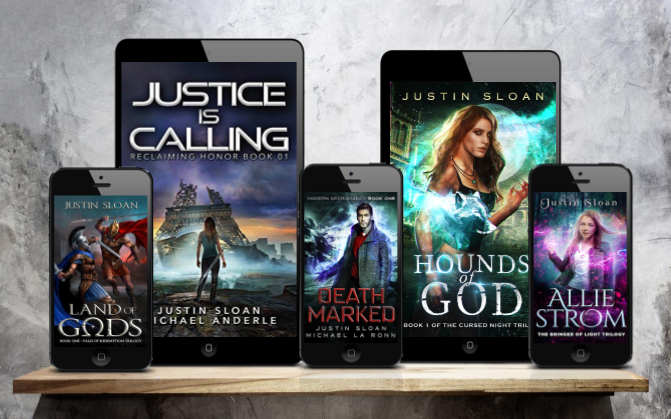 So, Justin, you’re pretty prolific – there’s 40 books on Amazon with your name on them; you podcast, you write for Military.com, and not do you write only write science fiction and fantasy, but you also author books on writing. What’s it like to be you, producing all this work? What kind of schedule are you on? How do you maintain your output? What do you use to write, and what tools or habits have really impacted how you work? I love writing. It never feels like a job, and the moment it does I know I’ve overcommitted or gotten involved with a project I shouldn’t be involved in. Writing is a passion, and if an author out there says otherwise, I can’t possibly understand why they would be doing it. For me it’s just fun, and happens to now be paying my bills – a dream come true! I am straight up with MS Word. I tried Scrivener, and didn’t like it. I also had Final Draft and all that for screenwriting, but honestly prefer the Amazon Story Writer tool (it’s free!). For me, output is all about knowing what I’m going to write. I keep a healthy mix of outlining, research, and staying motivated by playing video games or watching movies (related, so it’s also research). Some of the best storytelling nowadays is in video games, so if you’re trying to write but don’t play games, you’re missing out. Go play Oxenfree — you’ll be amazed. What made you become a writer? And specifically, a self-published indie author? I started writing when I had finished the first four Game of Thrones books (A Song of Ice and Fire series) and Harry Potter, and I wanted more amazing stories to read and inspire me, but was having a hard time finding ones on that level. So while I searched, ideas just started popping into my mind. “What if there was a book like this, or about that,” I would think and started jotting them down. Then I started writing, and fell in love with the prices. Self-publishing? I think that was all about the freedom. I just had too many horror stories from friends about the traditional route, whether it was time it took with the big ones, or mistakes from the indie presses. I had heard great things bout self-publishing while at the San Francisco Writers Conference, and decided to give it a try. I love it! What were your first successes as an author, and your biggest mistakes? What did you learn from them? My biggest success came when I finally partnered with Michael Anderle. Since then the writing life has been great. My ideas are flowing, the pages seem to write themselves, and I’m making enough to quit my day job and go full-time. The right collaboration can make all the difference. I think a mistake has been to take a break from the successful series to try writing one of my other ones, which didn’t do as well. If you have a successful series, write it hard! You’ve worked on a lot of pretty big properties and Telltale. What’s in like in the games industry? What did you have to do? Writing for games is amazing. Imagine just sitting around coming up with awesome ideas for stories and characters all day, and then writing them? And not by yourself, but with a bunch of other amazing creatives. That’s what writing for games is like. At Telltale I was a writer, which meant story, action, dialogue, everything. What were the biggest successes you had building up your personal brand across all these media properties? Now that you’ve left your job at Telltale to pursue the author journey full time, what goals and deadlines keep you ticking? Where do you see yourself? Oh, it’s on! Haha. I plan on writing six hours a day, with breaks for working out, a quick lunch, and a weekly podcast. My goal is 150,000 words a month, and I think that should be easy, based on the math. And that’s 2.5 books for me, so I think I can easily say that 2017 will be an amazing year. Top ten? That’s tough… Let’s go with the Song of Ice and Fire books first, then Harry Potter. Name of the Wind, Elantris, Way of Kings, the Mistborn trilogy. Time bound. The Princess Bride. The Zane Halloway series, and the Travelers Gate trilogy. A shout out to Justin for sparing the time to answer my questions. He lives at www.justinsloanauthor.com. 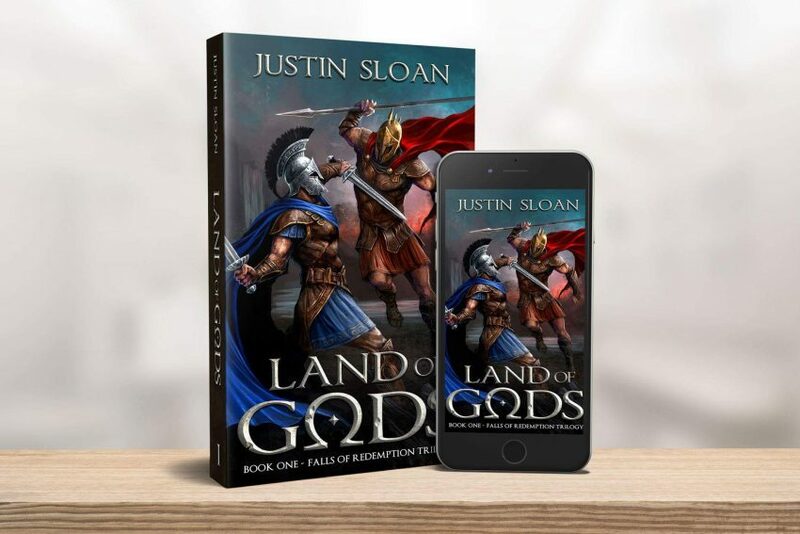 As of the time of writing, he’s got a new audiobook out for Land of Gods and a new book release in the Kutherian universe called the Angel of Reckoning. Would you like to know when the next interview comes out? Drop me your email below and I’ll ping you as soon as it does.